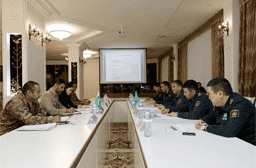 ASTANA (KazInform) — At the National Military-Patriotic Centre of the Armed Forces of the Republic of Kazakhstan in Astana, the defence ministries of Kazakhstan and Pakistan have held a conference on the planning of Dostarum joint international exercise. The exercise, in which the two countries’ special forces units will participate, is scheduled for this summer of 2019. At the conference, the sides discussed the aims, the objectives, and the stages of the training exercise. During the visit, the Pakistani military delegation visited the National Museum of the Republic of Kazakhstan and other sights of the capital.